When skilled locksmiths are unable to crack a safe, sometimes drilling is required to either bypass or observe the lock mechanism. Because of this, drill-point diagrams are published by manufacturers for specific safe models. Locksmiths and safe manufacturers ensure these diagrams do not end up in the wrong hands, as drilling locks is commonly used in burglary attempts. With observational safe openings, a hole is drilled to provide line of sight to the internal lock mechanism. While watching the lock through the hole, the locksmith manipulate the dial. The dial is operates until the lockgates are aligned, the fence falls, and the bolt becomes disengaged. When a locksmith bypasses the combination lock, the bolt mechanism is manipulated directly. The majority of safes are manufactured using either hardplate steel or composite hardplate. Composite hardplate use tungsten carbide chips embedded into the metal casting. These chips protect the locking mechanism by destroy drill bits. To drill through hardplate, special tungsten-carbide or diamond drill bits are required. Even with the right drill-bits, this can drilling into a hardplate safe can be labor intensive and time consuming. Some of the higher end safes come with a sheet of tempered glass known as glass relocker. 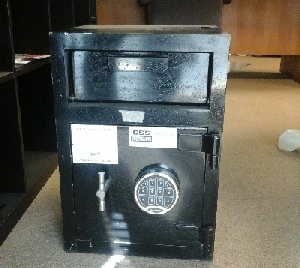 The glass relocker is mounted in-between the combination lock and the door of the safe. Wires are attached to the edges of glass relocker which lead to randomly located spring loaded bolts. A lot of modern high end safes have thermal relockers in addition to the glass re-lockers. Thermal relockers protect safes from torches by activating when the temperature of a safe exceeds a certain level. For more information on safe drilling check out this wikipedia article.